Instrumentation: Soprano and tenor soloists, accordian, viola and cello, OR Soprano and tenor soloists, accordian, cello, synths and sounds. First performance: produced by Gestalt Arts at the Asylum, directed by Ruth Mariner-Willow, music director William Cole, with singers Maud Millar, Ollie Brignal and Grace Nyandoro. See production photos. Film made in collaboration with Peter Groom, based on my concert piece Air Unfolds. Funded by RPS / Ideastap. Settings from A Midsummer Night's Dream for live performance as part of the production by Blackheath Youth Theatre, directed by Simon Geal. Original music for the first production of Freak, written and directed by Anna Jordan and produced by Theatre 503 and Without A Paddle Theatre at Theatre 503, Battersea, London. Sound design and original music for productions as part of the Identity Drama School winter showcase series, at The Courtyard Theatre, Hoxton, London. Music for productions by Capital Theatre and Progress Theatre of the play by Polly Teale. 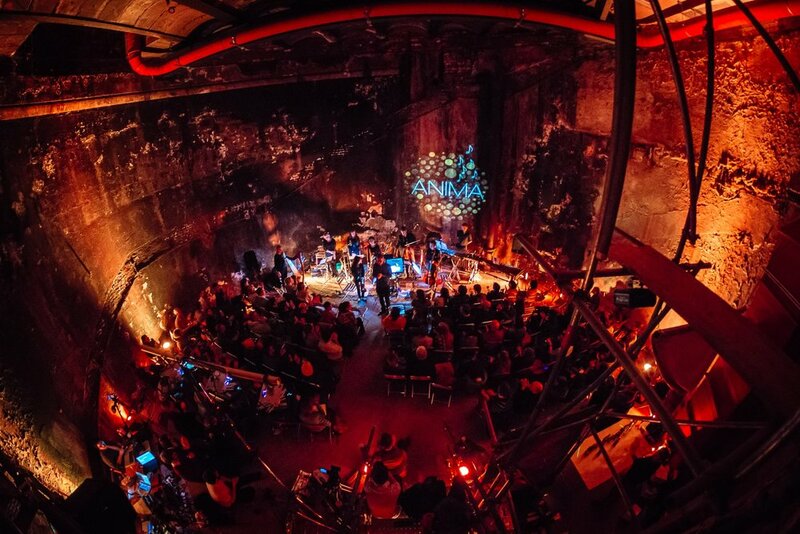 Animation and live music, created in collaboration with animator Carolina Aguirre for performance 42 feet underground, inside the Brunnel Tunnel Shaft, Rotherhithe - a huge circular space once leading underneath the Thames. The work was projected across a super-widescreen stretch of the curved grimy brick wall with 10 musicians performing the score live. Commissioned by ANIMA as part of the Mechanika project. Soundscape incorporating spoken quotes about music and art education, projected in a 7-channel surround system as part of an immersive installation for The Conservatoire, Blackheath. First performance: 20/2/14 at Dora Stoutzker Hall, Royal Welsh College of Music & Drama, Cardiff by Sinfonia Newydd, cond. James Southall. Commissioned by Sinfonia Newydd. Instrumentation: Soprano, harp, clarinet, double bass. First performance: 20/6/15 at Lovescapes: A Musical Exhibition, Crypt on the Green, St James Clerkenwell, by The Hermes Experiment. First performance: 5/6/14 at Nonclassical, London by The Hermes Experiment. Commissioned by The Hermes Experiment and supported by funding from the PRS Foundation / Bliss Trust. Instrumentation: Mezzo-soprano, baritone, alto flute, bass clarinet, horn, percussion, harp, 2 violins, viola, cello and double bass. Instrumentation: Soprano, alto, SATB choir, 2 violins, 2 violas, 2 cellos, double bass. First performance: 1/6/14 at Rolf Hind's Occupy The Pianos festival at St. John's Smith Square, by Robin Green. First performance: 16/11/14 at Nonclassical Pioneers of Percussion festival, The Macbeth, Hoxton, London, by Tom Lee. First performance: 17/10/13 at the Chapel, King's College London by Ayre Flutes. Commissioned by Ayre Flutes. First performance: 21/4/15 at The Forge, Camden, London by the Laefer Quartet. Instrumentation: 2 flutes, 2 oboes, 2 clarinets, 2 horns, 2 bassoons, or string ensemble. First performance: 31/7/13 at Monmouth Music Festival by the Monmouth Festival Wind Dectet, conducted by Chris Petrie. Commissioned by Monmouth Music Festival. First performance: 17/9/11 at Cardiff Music Festival by Anne Denholm (harp). Commissioned with support from the PRS for Music Foundation. First performance: 16/9/11 at David Josefowitz Recital Hall, Royal Academy of Music, London.